Get complete visibility into what's going on in your Amazon Web Services (AWS) environment. 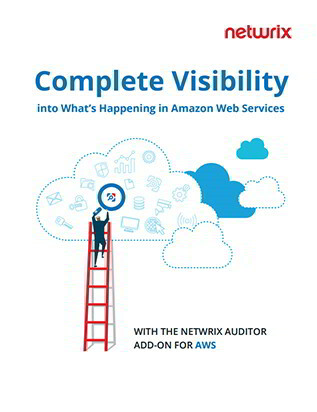 Simply integrate AWS with Netwrix Auditor through the RESTful API with this free add-on. Bring complete visibility into all changes made in your AWS environment with actionable audit data that includes who-what-when-where details. Quickly produce audit reports highlighting what's happening in AWS for security and compliance purposes. Keep an eye on security changes in your AWS environment with the Google-like search and multiple search filters that speed up detection of suspicious activities and enable you to determine the root cause before a data breach occurs. Keep your audit data archived and at your fingertips for years in the two-tiered storage. You can instantly access it the next time there is a security investigation or auditors require a periodic check. Review detailed instructions for installing the Add-on for Amazon Web Services. Start getting complete visibility into changes and data access throughout your AWS environment. 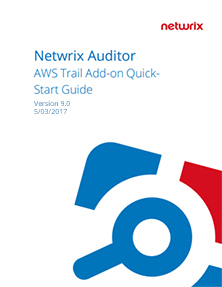 This eBook explores how the Netwrix Auditor Add-on for AWS delivers the comprehensive auditing you need to ensure security and compliance in your AWS environment.